AirLink® MG90 is a high performance LTE-Advanced vehicle multi-networking platform, purpose built to provide secure, always-on connectivity for mission critical applications in public safety, transit and field services. With extensible multi-network connectivity, Airlink MG90 multi-networking router offers dual LTE-Advanced with Band 14, Dual Concurrent Gigabit Wi-Fi and Gigabit Ethernet, with extensions to Land Mobile Radio (LMR) and satellite systems. Built for first responders and in-field personnel, the AirLink MG90 offers up to 300 Mbps downlink speed over LTE Advanced, 1.3 Gbps over dual radio, dual concurrent 3x3 MIMO 802.11ac Wi-Fi, and 5-port Gigabit Ethernet. The AirLink MG90 can host up to 128 clients at any one time, and concurrently connect multiple mission critical applications in and around the vehicle including laptops, MVRs and tablets, in addition to providing live video streaming, and rapid secure access to remote databases. Purpose built for vehicle power environments, the AirLink MG90 router does not require any external power conditioning, is optimized to survive extreme transient surges, and maintains continuous power through cold cranking as low as 5V. 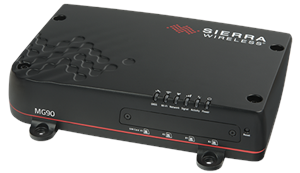 Offering built-in vehicle-ready I/O, Bluetooth and Vehicle Telemetry interface, Sierra Wireless Airlink MG90 enables remote monitoring of auxiliary devices, such as light bars, sirens and gun racks, and can collect OBD-II vehicle telemetry data for engine diagnostic and performance data to monitor vehicle health. AirLink® Mobility Manager (AMM) is a leading-edge, end-to-end network management solution that enables simplified, remote and real-time mass configuration, control and troubleshooting of all AirLink® routers and gateways, connected mobile assets and mission critical applications. AirLink Mobility Manager available “in the cloud” (for MG routers and gateways) and “in the enterprise” (for all AirLink routers/gateways), AMM displays a virtual dashboard with an up-to-date view of the entire fleet, and delivers a continuous stream of rich, real-time network data, allowing users to observe, track and examine the behavior of hundreds of devices, networks, and connected vehicle parameters as it occurs. Sierra Wireless AirLink MG90 is a high performance LTE-Advanced vehicle multi-networking platform, purpose built to provide secure, always-on connectivity for mission critical applications in public safety, transit and field services. Sierra Wireless Airlink MP70 is a high performance LTE-Advanced vehicle, or mobile, router designed for use by first responders, public safety and traffic vehicles, and service and fleet vehicles. AirLink MP70 is FirstNet ready router.